Thermochemical conversion process is one of the most promising routes to harness the potential of oil palm biomass as renewable energy alternative in Malaysia. 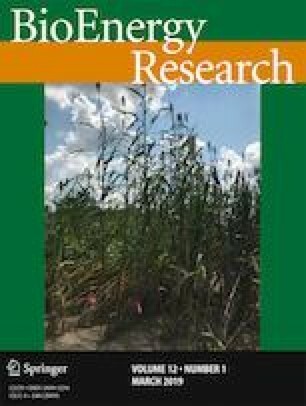 Despite this potential, there is a lack of comprehensive study that characterises the complete spectrum of oil palm biomass. In this work, thermogravimetric-mass spectrometry (TG-MS) results of five oil palm biomass, i.e., oil palm trunk (OPT), palm kernel shell (PKS), oil palm frond (OPF), mesocarp fibre (MF) and empty fruit bunch (EFB), in pyrolysis and combustion conditions are presented and analysed. Kinetic studies on the TG data of these biomass were performed using Coats–Redfern integral method and Šesták–Berggren function to determine the activation energy and the reaction mechanism at different thermal decomposition stages. Pyrolysis of hemicellulose, cellulose, and lignin occurs at 140–331, 235–435, and 380–600 °C, respectively, while combustion of hemicellulose, cellulose, and lignin took place at 140–313, 225–395, and 372–600 °C, respectively. The activation energy was the highest for cellulose decomposition in both pyrolysis and combustion cases. Phase boundary reaction dominated during hemicellulose and cellulose decompositions, while nucleation dominated during lignin decomposition and char oxidation. MS results show that majority of the gases came out between 250 and 600 °C, mainly from CH4 and H2O in pyrolysis case and from CH4, CO2 and H2O in combustion case. Other than these major gases, NO, NO2 and SO2 were also generated although in much lower proportion compared to these gases. Based on TG-MS results, the best potential application for each biomass was also identified where OPT and OPF are suggested for gasification and fermentation, PKS for bio-char production and combustion, MF for bio-oil production, combustion, and bio-char production and EFB for bio-oil and bio-char production. The online version of this article ( https://doi.org/10.1007/s12155-019-09974-9) contains supplementary material, which is available to authorized users. Jiuan Jing Chew and Jaka Sunarso gratefully acknowledge the Research Micro Fund Internal Grants provided by the Swinburne University of Technology Sarawak Campus (“Characterization of oil palm biomass for thermochemical processing” and “Evaluating the gaseous emission from thermochemical processing of biomass”).